(Newser) – It's not $136 million in art, but it's not an ex-boyfriend, either. Rather, the latest attic find is a perfect condition Chinese vase from the 18th-century Qing dynasty. 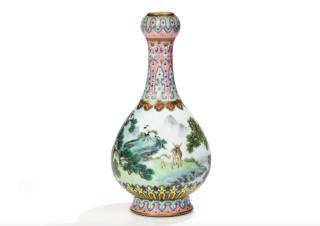 Its owners took the vase, reportedly made for the Qianlong Emperor, to be appraised at Sotheby's three months ago after finding it stashed in a shoebox in the attic of their French home, reports CNN. Sotheby's says the vase of Famille Rose or yangcai porcelain, known for its soft color palette and Western influence, is "the only known example of its kind." But "we didn't like the vase too much, and my grandparents didn't like it either," one of the owners, whose grandparents were left the vase and several other pieces of Chinese and Japanese art by an uncle, tells AFP. They might like it more now, with Sotheby's predicting it will sell for up to $850,000 at an auction next month. Hey Ya all better cheek you attics ya never know what TREA$URE you may find. Like Me I found a 1943 Copper Cent. How Much ya think that's worth? Not wild about its form, but the scenic is lovely. Was first taught about Famille Rose collectibles by a refugee of the Islamic Iranian Revolution. His family had been supporters of Shah Reza Pahlavi. Like many other wealthy, Westernized Iranians, when the revolution happened, they fled to the West. My friend's mother was an antiques dealer in Washington, DC. He was a NYC architect.